IOM is reporting today (16/12) 7,189 migrants and refugees have died or remain missing on world migratory routes. This is the highest yearly number IOM has ever recorded, and represents an average of 20 deaths per day, suggesting the deaths of another 200-300 men, women and children well may be recorded worldwide before 2016 comes to an end. This week’s number of migrant deaths recorded globally in 2016 was compiled by IOM’s Missing Migrants Project and Global Migration Data Analysis Centre. By comparison, total fatalities compiled by IOM in 2014 (5,267) and 2015 (5,740) both fell hundreds of victims short of the 6,000 mark, a figure that was surpassed this year before the end of November. As in the previous two years, the number of deaths on the three principal Mediterranean routes linking North Africa and the Middle East with Europe accounted for over 60 percent of all deaths worldwide. IOM reports the number of migrants recorded as dead or missing and presumed dead – appears to be rising across all regions, including the Mediterranean, Northern and Southern Africa, as well as in Central America and in the United States-Mexico border region. Each already has surpassed those recorded in these regions through all of 2015, according to recent IOM data. 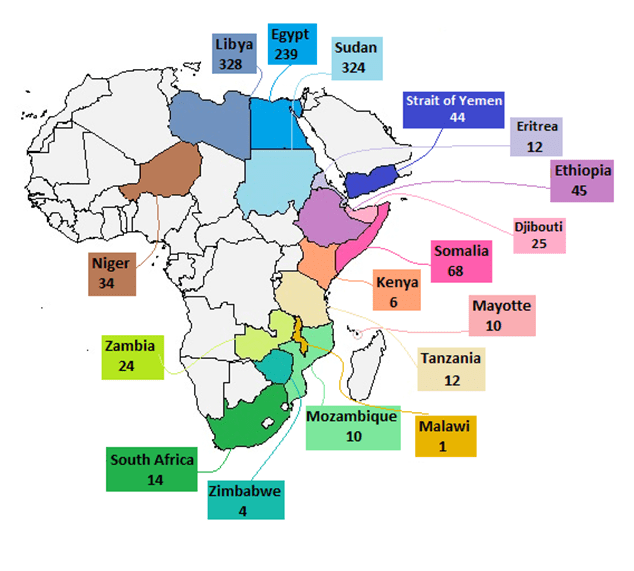 For Eastern and Northern Africa, the Missing Migrants Project relies on the work of the Regional Mixed Migration Secretariat’s (“RMMS”) Mixed Migration Monitoring Mechanism Initiative (“4Mi”), which surveys migrants from Eritrea, Ethiopia, Djibouti and Somalia. Data collection monitors in migration hubs in 13 countries across Europe and Africa ask migrants in transit a variety of questions to do with their journey, including whether they have witnessed the deaths of other migrants along the way. The findings of 4Mi’s survey indicates that over 700 migrants from Eritrea, Ethiopia, Djibouti and Somalia have died during migration in 2016. These deaths are due to vehicle accidents, violent attacks and other harm associated with a lack of access to medicines, shelter, food and water during their journey. The majority of these deaths occurred in Sudan, Egypt and Libya. It is likely that many more deaths go unrecorded by any official government or humanitarian aid agency. But they often are recorded by migrants themselves. Among IOM’s most important sources of information are testimonies of other migrants, who are videotaping these daily tragedies on cell phones, or alerting family members and friends of the deceased via Facebook posts and other social media. Mining these veins of information IOM’s Missing Migrants team this year discovered hundreds of victims in Latin America, off the coast of Yemen or on lonely highways across Africa. In Latin America, there have been 90 more deaths recorded by the Missing Migrants Project than by the same time in 2015. News emerged this week that so far in 2016, at least six people drowned off the coast of Mazatlán, in Chiapas, Mexico, where migrants board smuggling boats and head north towards the United States. The Darién Gap, between Colombia and Panama, has also seen at least 30 people die while migrating so far in 2016, many of whom were Cuban. In Texas, where a record 176 bodies have been recovered along the Mexican border in 2016, there is a new effort to try to help identify those who have died in the desert, with the project by the Texas Observer, called “I have a name/Yo tengo un nombre”. Belongings and pieces of clothing left with the deceased have been photographed and added to the project’s database in the hope that some of them may be recognized. Although increasing attention brought to the issue of the migrant deaths is helping to improve information gathering, the data in themselves indicate the high risks that people can face in their journey to find a better life, and that there are significant challenges to the UN’s call for “safe migration”. Meanwhile IOM reports that 357,249 migrants and refugees entered Europe by sea in 2016 through 14 December, arriving mostly in Greece and Italy, compared with 883,393 through the end of November 2015. Some 178,802 people have arrived by sea in Italy in 2016 – more than in either 2014 or 2015. Some 172,813 migrants and refugees arrived by sea in Greece during the same period, far fewer than in 2015. IOM Rome’s Flavio Di Giacomo reported Thursday that 2,124 migrants have been rescued since IOM’s last report earlier this week. He added that on Wednesday Italian authorities reported another shipwreck, which claimed at least 20 victims. Survivors were brought to the port of Augusta. The total number of migrant and refugee fatalities in the Mediterranean since the beginning of 2016 as of late Thursday was 4,812. IOM Libya reports this includes the deaths since 5 December of some 51 people whose bodies were retrieved from six different incidents in three separate locations, mostly near Tajoura, outside Tripoli, Libya. Information received by IOM Friday morning indicates an additional 87 victims are feared missing after a boat carrying 114 was reported sank off the coast of Zawiya, Libya. The Libyan Coast Guard reportedly rescued 27 from that incident. An additional single body was found Thursday in Zawiya. If confirmed, the addition of these 88 victims would bring the total number of people lost in the Mediterranean to at least 4,900 through the first 50 weeks of 2016 – just under 100 victims per week. Quelle « crise migratoire » ?